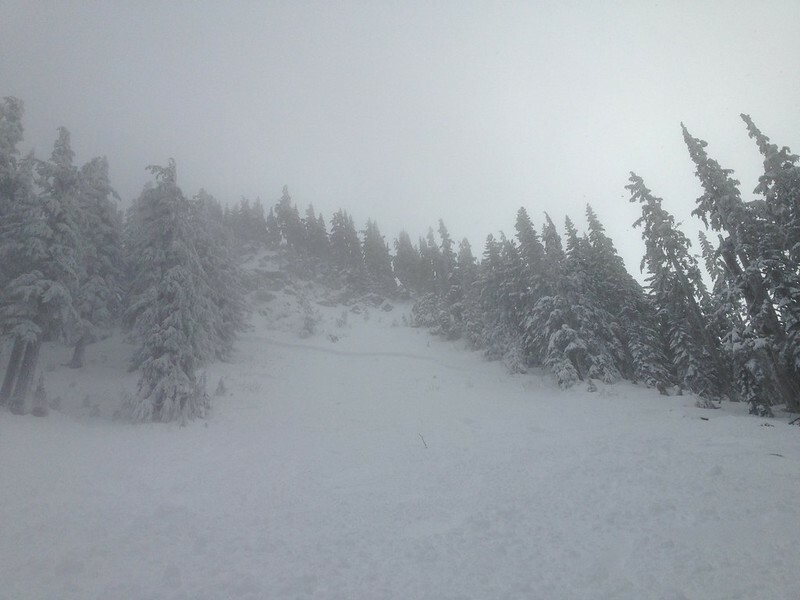 Quick post mainly as a heads up on avy conditions at Stevens. 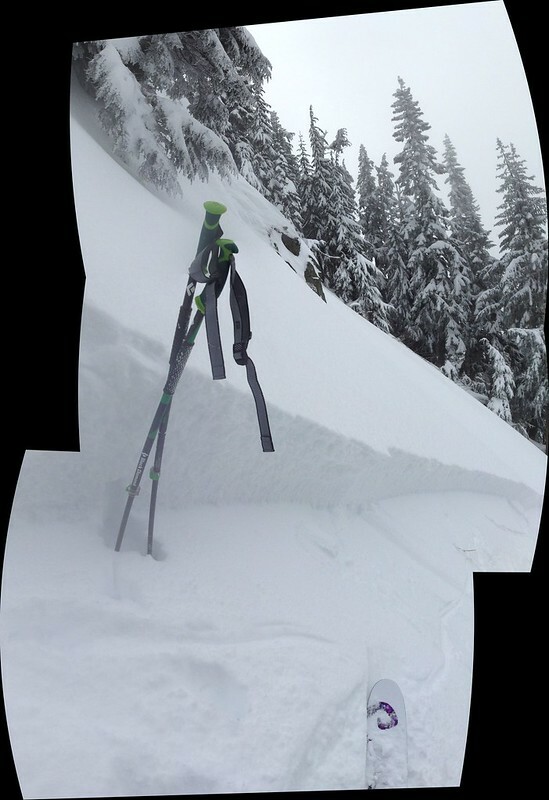 I triggered a good size soft slab (14" depth, ~100ft across) at the top of Nancy's chute (middle of the three chutes that empty out between the base of 7th heaven and top of Skyline). It ran about 50% of the path, releasing on a crust I suspect formed during the storm at elevations above ~5400ft in the lull between the initial bands of precipitation Friday afternoon and the convergence zone which developed late Friday evening. At lower elevations, this density interface could be felt with pole probing, but temperatures were not low enough to form the ice crust found higher. Aspect was NW, elevation ~5600ft. Excellent report, thanks for posting. Thanks for the report Andy, glad you are okay.� Did this happen on your way up or down? 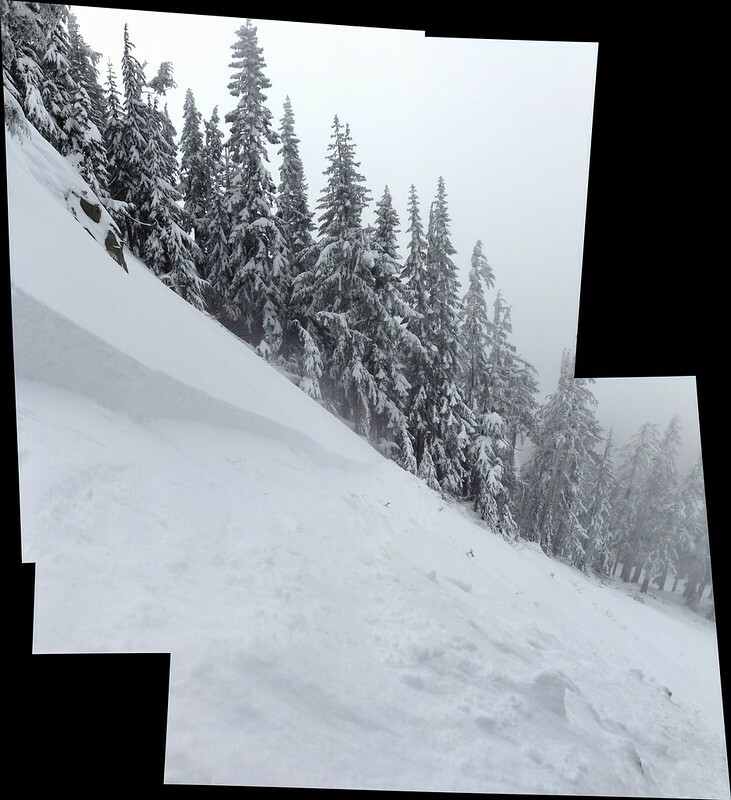 There was an additional slide in the Orion Chutes area at Stevens yesterday. The crown was on a steep convex rollover, supposedly skier triggered. From our vantage point we couldn't tell if it initially released on that same layer you mentioned or if it was on the old snow layer but when it got going it ran on the old snow layer. It was significant in size--I would guess the path was 100' across and ran well into Pegasus Gulch--maybe 900 vf. do you use an airbag. you know the snow like the forecasters do - thanks. Mike, triggered this on the down. We entered Bobby's chute from the top left, which had better terrain anchoring (tops of young trees visible above the snow). We watched a solo skier with dog enter and descend from the right side entrance, so felt ok with that line initially. After our group made the entrance and reassembled in the trees on the right side, my girlfriend and I decided to traverse left to Nancy's chute while the rest of the group finished descending Bobby's. We stopped at the edge of the trees at the top right of Nancy's, and as I moved forward a stride to assess conditions the whole thing cracked across the top and slid a few hundred feet to where the slope angle became shallower. All mtn, started using an airbag last season at my girlfriend's insistence. After seeing this, I sure won't leave it at home. After all the reports from Stevens on Saturday, I'm really grateful nobody got hurt. The setup was primed between the amount of snow, wind loading, and crust layer present in some locations, let alone the number of folks out... while skinning up Skyline, we looked over and saw quite the conga line headed up Big Chief, easily over 50 folks heading up. Indeed. I was wondering if the ground truth would match the speculations/predictions, and it sounds like it did. Thanks for the report and pictures, Andy. Glad you are OK. I didn't realize it was such a close call - glad you are OK!